CONT (VC/RC) During your turn, this unit gets Power+5000 for each of your locked cards. AUTO (RC) When it attacks, if you have a locked card, COST [Soul Blast 1], this unit and your vanguard gets Power+10000 until end of turn. 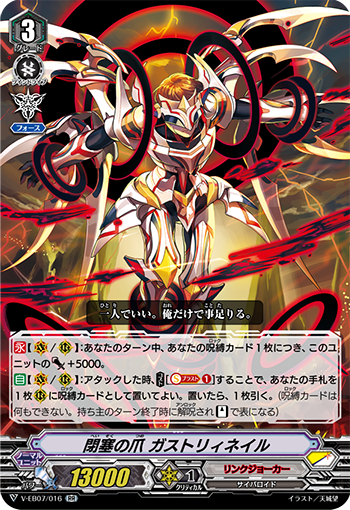 AUTO (VC) When placed, COST [Counter Blast 1 & Soul Blast 1], choose one of your opponent’s rear-guards with the highest grade among them, bind it face down, and you draw cards equal to that unit’s grade.